IF YOU ALREADY OWN A TASCAM DR-08 YOU MAY STILL PURCHASE SOME OF ITS ACCESSORIES FROM OUR DR-08 WEBSHOP BELOW. Here's a really compact portable digital recorder that's about the size of an office 'dictaphone' and will just slip into a shirt pocket, it's so light and slim. 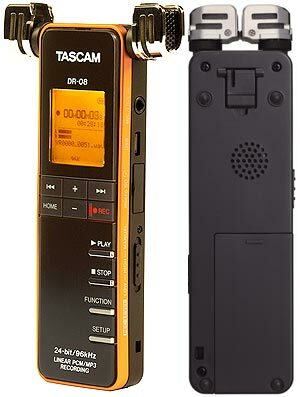 But - make no mistake - unlike an office recorder, Tascam's DR-08 delivers serious audio quality from its miniature frame. It captures audiophile-grade 96kHz/24-bit WAV files as well as web-friendly MP3 files - to its robust MicroSD media. The built-in microphones have a unique mechanism to change the width and angle of the elements, allowing you to tailor the pattern for the perfect recording. There's even a built-in kickstand for placing the recorder right where you want it. 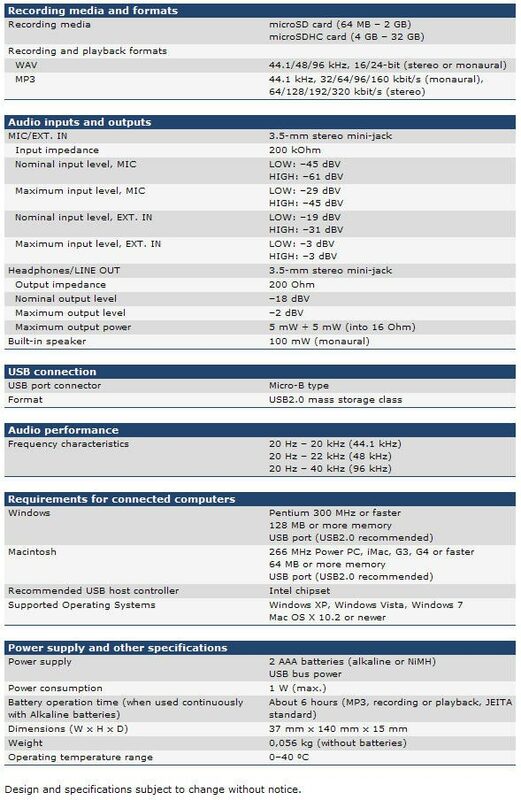 A pair of AAA batteries allows you to record for hours to the included 2GB card, then transfer the recording to your computer using high-speed USB 2.0. Like TASCAM's other best-selling portable recorders, the DR-08 has features like auto level control and a low cut filter for clear recordings. Add your own microphone or line-level source using the 3.5mm stereo mini-jack input. The DR-08 has loop and variable speed on playback, allowing you to slow down speed without changing the pitch to learn new music. There's also noise cancelling and EQ functions for improved playback timbre. 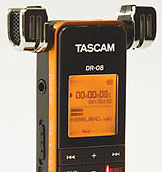 TASCAM's DR-08 is Tascam's most portable recorder yet. Whether you're a songwriter, live performer, business leader or sound designer, you won't want to step through your front door without the great-sounding little TASCAM DR-08.